WASHINGTON — With the February opening of streetcar service along the 2.4-mile H Street-Benning Road corridor, Washington joined a national trend of major cities rebooting what was once considered an antiquated mode of urban transportation. Far from being an exercise in nostalgia, the rekindled love affair with the streetcar is not only bringing public transportation to under-served areas, but is also aimed at stimulating economic growth in key commercial districts. Since 2000, seven major cities in the United States have installed streetcars. Besides Washington, the cities are Seattle; Portland, Oregon; Salt Lake City; Dallas; Tucson, Arizona; and Atlanta. Several others are in the planning or construction phases. All seven systems are modern, second-generation streetcars on new lines, not part of so-called “legacy” systems that in some cases, such as New Orleans and San Francisco, have been running for more than a century. Nor are the second-generation streetcars throwbacks to a bygone age, such as CityLYNX Gold Line, in Charlotte, North Carolina, which opened in 2015 using replica historic streetcar models known as heritage cars (they are slated to be replaced in about three years). Streetcars are a type of “light rail” service. Each system uses single cars that run along city streets on tracks, usually in mixed traffic, as opposed to exclusive rights of way. Each of the new DC Streetcar vehicles is 66 feet long and 8 feet wide, capable of holding approximately 157 passengers. The streetcar service runs Monday through Thursday from 6 a.m. to midnight and on Friday and Saturday until 2 a.m., with no current Sunday service. It will be free to all riders for the first few months of its introductory period. But streetcars like Washington’s are filling in transit gaps. The H Street segment is envisioned as the first part of a larger streetcar system that the District Department of Transportation (DDOT) plans to construct in coming years. “The premise is to provide the ridership capacity of a larger train for a manageable route of a bus service,” Guzzetti said. Unlike the farther reaches of light rail and heavy rail networks that connect suburbs to central cities, streetcars “will circulate around downtown or commercial districts,” Guzzetti said. Portland began operating replica vintage streetcars in 1991. But when it came time to replace them, the city decided to buy modern cars that were equivalent in expense but higher-tech. “The city of Portland, as well as several prominent business owners and developers, saw a need to also provide circulation within the core of Portland, as there was not the high-capacity, permanent transit available once you were downtown,” said Julie Gustafson, a spokeswoman for Portland Streetcar. Using the same Czech-inspired United Streetcar (now built by Oregon Iron Works) vehicle brand as Washington would later implement, Portland chose cars that are approximately 20 meters (more than 60 feet) long and 8 feet wide, with low floors that make it easy to board and exit and are accessible to disabled passengers. Fifteen years in, Portland Streetcar has an average ridership of 15,000 a week. As of December 2014, $4.5 billion worth of new development had sprung up along the line. Washington’s plan was similar. In 2003, the city began plotting the streetcar system routes to serve several economically depressed neighborhoods. According to the District of Columbia Transit Alternatives Analysis published in 2005, traffic was another factor. The bus services, in particular, were not ideal for transporting heavy amounts of people through active thoroughfares, thus contributing to further congestion. Because of delays over funding, planning and several changes in city administrations, the DDOT spent more than $200 million on the project. So far, the Atlanta Streetcar makes a 2.7-mile loop through downtown. The addition to the city’s transit network has boosted real estate values, increased tax revenue and helped create jobs, Robinson said. “We’re tracking more than $2 billion of new and planned real estate investment within a five-minute walk of the track alignment,” he said. “We don’t have space in the urban core to support more or altered bus routes,” Robinson said. “The BQX will be a state-of-the-art streetcar that ... has the potential to generate over $25 billion of economic activity for our city over 30 years,” de Blasio said. Unlike some other Northeastern cities, New York had shut down its last streetcars by the 1950s for mass transit options that addressed its high-density sprawl. Competition from the car and bus, as well as other factors, helped kill the city’s once-ubiquitous streetcars. “Although they have their [rights of way] the majority of their trips, once they arrive in Center City they function as traditional trolley services like a bus on rails before funneling into subway tunnels,” Johanson explained. 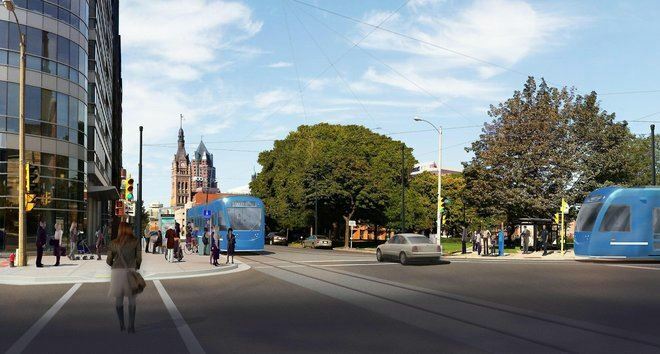 This is a rendering of a Brookville streetcar in Milwaukee's Third Ward. The city is applying for a $20 million federal grant to extend the Milwaukee Streetcar north along 4th St. Credit: Brookville Equipment Corp. The city is applying for a $20million federal grant to extend the Milwaukee streetcar north to the new Bucks arena. The route extension would run on N. 4th St. from W. St. Paul Ave. to W. Highland Ave.
"We're taking one extension at a time," said Ghassan Korban, Milwaukee's Department of Public Works commissioner. He said the proposed extension would also move the streetcar route closer to Bronzeville. The earliest the extension would open would be 2020, Korban said. The downtown streetcar route is expected to be open for passenger service in 2018, with the lakefront loop opening in 2019. Korban said that the federal grant announcements are typically made in late September, and he expects the same this year. The northern end of the planned extension would reach the "doorstep" of the new Milwaukee Bucks arena, which is expected to break ground this summer. Korban said the city is excited about the extension because it would be shovel-ready, and will connect key attractions such as existing hotels as well as planned attractions. "The idea all along has been that the original route needs extensions to make the streetcar route more successful and efficient," Korban said. "And this is the first next step in terms of having a meaningful extension to add to the success of the streetcar increasing connectivity downtown." He said that if the city receives the $20 million grant, it would cover about 50% of the estimated costs for that extension. The city could cover the rest using a tax incremental financing district, like how it financed the first phase and lakefront loop. "We're very excited about this opportunity, and trying to keep the momentum going," Korban said. The federal grant money would come from the Transportation Investment Generating Economic Recovery, or TIGER, grant program. The city in November picked Brookville Equipment Corp. to build its first four streetcars. Earlier this month, the city opened bidding for companies hoping to oversee the streetcar project. Contractors have until June 1 to submit proposals to lead the project, which would involve serving as construction manager and general contractor for the 2.5-mile downtown streetcar route and lakefront loop. 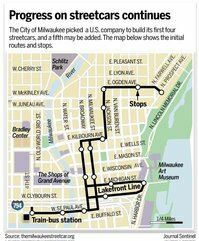 Service for the initial downtown Milwaukee street car route is expected to begin in the fall of 2018. 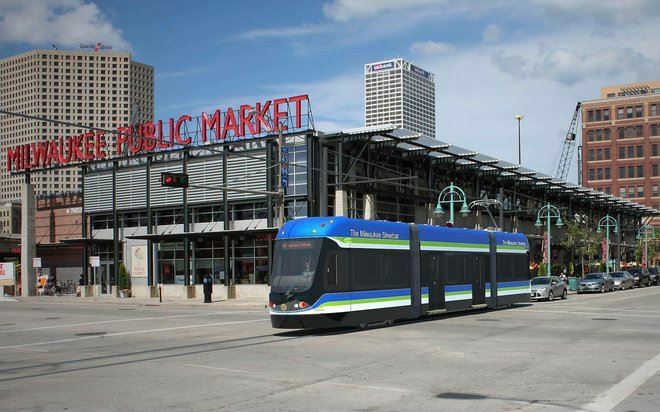 The city has opened bidding for companies hoping to oversee the Milwaukee streetcar project. Contractors have until June 1 to submit proposals to lead the project, which would involve serving as construction manager and general contractor for the 2.5-mile downtown streetcar route and lakefront loop. The winning company will oversee all the construction activities for the first phase of the streetcar project. That will include installing the track, building the overhead contact system, and handling all necessary civil and road work for streetcar stops and the operations and maintenance facility. City officials say construction for this phase of the streetcar and the maintenance facility will begin in late summer or early fall, and will continue until 2018. The first streetcar, which is being built by Brookville Equipment Corp., is scheduled to arrive in Milwaukee in December 2017. The $18.6 million contract calls for Brookville to initially build four cars, but the company may be tapped to make a fifth vehicle for the lakefront line in the near future. City officials say the company could eventually manufacture as many as 24 vehicles for Milwaukee. The streetcar plan, which aims to connect the Milwaukee Intermodal Station with the city's lower east side, was approved by the Common Council last year. The project's capital budget is about $128 million for a 2.5-mile route, with an estimated $3.2 million operating and maintenance budget. The City of Milwaukee Department of Public Works said the contractor would be chosen based on price, qualifications and approach to the project. This request for proposals can be found online, and companies interested should call (414) 286-3314. Proposals are due by 4 p.m. June 1. East Troy Electric Railroad's former Chicago South Shore & South Bend cars carry a load of passengers eastward on a Christmas-themed train in December 2015. EAST TROY, Wis. — Photographers and railfans will be able to enjoy more trains and a longer train ride at the East Troy Railroad Museum in Wisconsin this year. The railroad recently unveiled its 2016 schedule that will include more trains, added dinner trains, and a longer operating route that features a stop at Indianhead Park in Mukwonago, Wis. The new schedule is part of the railroad’s 2016 season that officially opens for regular business on April 30. The museum will operate up to seven daily departures each Saturday and Sunday from East Troy. Trains will also be departing from Indianhead Park this season. In addition to its regular weekend schedule, the railroad says that its popular dinner and pizza trains will continue in addition to several new “theme trains” designed to appeal to different food heritages. Italian, Mexican, German, and classic American foods will be among some of the dinner items on board the special theme trains in 2016. A series of special events are also on the itinerary for 2016, including a Railfan Day on June 25 that will feature different sets of railroad cars. More information is available on the railroad's website. The Chicago Transit Authority Board voted Wednesday to approve a $1.3 billion contract for 846 rail cars — the biggest rail car purchase in the agency's history, representing about half of its total fleet. The contract also will create a manufacturing facility on the Southeast Side, the first of its kind in the city in 35 years. The winning bidder to build the 7000 Series cars is CSR Sifang America, whose partners include the Chinese state-owned rail car manufacturing company CRRC Qingdao Sifang and CSR America, which handles North American operations. The same manufacturer is currently building cars for the Boston transit system. The last batch of CTA rail cars, known as the 5000 Series, were designed in the last decade and built by Bombardier Transportation, which lost this year's bid. The new cars will replace 2600 Series cars produced in the 1980s. The 7000 Series cars will have a different seating arrangement than the 5000 Series cars, which have mostly aisle-facing seats. The wider, New York-subway-style aisles were intended to provide more standing room during rush hour, but have proved unpopular with some riders, who do not like getting their feet stepped on while seated, or having their views blocked by standing passengers. The new cars, with LED lighting and 37 to 38 seats each, will be a hybrid of the 5000 Series and the 3200 Series currently seen on the Brown and Orange Lines. The front of the cars will have aisle-facing seats to maximize standing space and make it easier for passengers to get on and off, while the rest of the car will have a mix of forward and rear-facing seat pairs and the popular single seats. The contract is expected to create 169 jobs — employing mostly union, high-skilled, sheet metal and electrical workers — at an assembly facility at 135th Street and Torrence Avenue, city officials said. The facility is expected to build the 7000 Series cars over 10 years — with prototypes coming out in 2019, and cars going into the system in 2020, said CTA spokesman Brian Steele. The facility would be the first rail-car assembly facility in Chicago since the Pullman-Standard plant closed in 1981. In a buoyant news conference at CTA headquarters after the board's vote, Mayor Rahm Emanuel called the deal historic and said he hoped the facility could also be used for other rail car orders from around the country. He expects suppliers to be drawn to the Hegewisch facility, bringing even more jobs. He said the deal was an example of the city using its purchasing power to create local employment, as it did when Chicago Police ordered its new cars from the South Side Ford plant. "It's one thing to order new cars and the customers will get a great experience. It's another thing to order those cars and create great manufacturing jobs in the city of Chicago, and bring back rail-car manufacturing to its proper home," Emanuel said. CTA president Dorval Carter said the purchase will give the CTA one of the country's youngest rail fleets — with the average age of a car dropping from 26 years in 2011 to 11 years once all the cars are delivered — and save $7 million annually in maintenance costs. While the board approved a $1.3 billion contract, the cost over time could be about $1.4 billion because of inflation as the CTA exercises its options to go beyond an initial purchase of 400 cars, Steele said. The CSR Sifang America bid came in $226 million lower than Bombardier's. Like the 5000 Series cars, the new cars will also convert the direct current supplied by the rails to an alternating current for propulsion, which provides a quieter, smoother ride, Steele said. The new cars will be bought with a mix of federal and local funds, the latter provided by a bond issue. The CTA first asked for proposals for the rail cars in February 2013, but the next year rejected the initial bids as incompatible with the 5000 Series. The agency then asked for the bids again, dropping the compatibility requirement and including a "U.S. Employment provision," asking bidders to provide the number and type of new jobs they planned to create. Jorge Ramirez, president of the Chicago Federation of Labor, said he hopes Metra would also consider using the facility for rail car manufacture. FRISCO, Texas — A Texas museum might be the last place you’d expect to find ex-Illinois Central Highliner electric commuter cars from Chicago, but the Museum of the American Railroad has just acquired 10 of them. Instead of static displays, the museum intends to use the cars as immersion classrooms at its museum in Frisco. While two cars will be preserved in their original state, plans call for others to be outfitted with the latest technology to assist with classroom instruction. Select cars will receive audio-visual enhancements, digital learning spaces, and interactive exhibits. The museum is currently seeking funding and sponsorships for the improvements. The Highliners will be branded the Stream-Liner, an acronym emphasizing science, technology, railroading, engineering, arts, and mathematics components of the Museum’s educational programming. Construction of the first three of ten exhibit tracks totaling 6,000 feet is underway. Upon completion, the cars will be placed on Track No. 7 for permanent display and use. The museum acknowledged the generosity of Metra Electric in assisting with the cars acquisition. BNSF Railway provided reduced rate transportation of the cars from Chicago to Texas. The St. Louis Car Co. built the original 130 Highliners for the Illinois Central in 1971-72. More information is available from the museum's website. (Feb. 12, 2016) – Forty-four years after the debut of the original Highliner cars on the Metra Electric Line, the last six of them carried their final passengers today from Chicago to University Park. State Senator Martin Sandoval, State Representative Al Riley, Metra Executive Director/CEO Don Orseno, members of the Metra Board of Directors and other guests took part in the official send-off from Millennium Station. The original Highliner cars began serving customers on the Illinois Central (IC), now the Metra Electric Line, on May 31, 1971. The cars were purchased in two separate orders. The first 130 cars were purchased from the St. Louis Car Company by the newly formed Chicago South Suburban Mass Transit District and leased back to the IC. Federal funds covered two-thirds of the $40 million cost and the IC paid the rest. In 1978-1979, the newly formed Regional Transportation Authority (RTA) bought the second order of 36 cars from Bombardier Inc. for $28 million. Metra took ownership of the railroad and the Highliners in 1987, rehabbing the cars and changing the color scheme from orange and brown to silver and blue. After today’s final run, museums will be the only place that rail fans will be able to view the original Highliner equipment. Twenty-four Highliner cars have been sent to museums including: Illinois Railway Museum in Union, Ill.; Union Depot Railroad Museum in Mendota, Ill.; Boone & Scenic Valley Railroad/James H. Andrew Museum in Boone, Iowa; and the Hoosier Valley Railroad Museum in North Judson, Ind. A rendering of a Brookville streetcar in Milwaukee's Third Ward. Milwaukee's streetcars will be manufactured by U.S.-based Brookville Equipment Corp. The City of Milwaukee has been awarded a $14.2 million federal grant for construction of a spur connecting the streetcar with the lakefront. The streetcar plan is depicted in this rendering. Oct. 26, 2015 3:26 p.m. The City of Milwaukee has been awarded a $14.2 million federal grant for construction of a spur connecting the streetcar with the lakefront. The U.S. Department of Transportation grant was announced Monday by Milwaukee Mayor Tom Barrett, U.S. Sen. Tammy Baldwin (D-Wis.) and U.S. Rep. Gwen Moore (D-Wis.). The Lakefront Line, which was approved by the Common Council along with the first phase of the streetcar in February, aims to connect Cathedral Square to the lakefront using Broadway and Milwaukee, Michigan and Clybourn streets. It will link the streetcar to the Couture development, which has a stop planned. "This critical federal grant for the Milwaukee Streetcar will bring thousands of residents and visitors to major attractions and new developments on Milwaukee's lakefront," Barrett said in a statement. "This announcement builds on the positive momentum we're experiencing in the heart of the city and will also have a significant impact on our neighborhoods, creating hundreds of construction jobs and better connecting our neighborhoods to downtown." The city is close to signing a contract with a streetcar-manufacturing company. "This is a strong federal investment in 21st-century Wisconsin infrastructure that will put people to work," Baldwin said. "The Milwaukee Streetcar will also help spur significant economic development and improve the quality of life for Milwaukee residents." Moore also praised the project, saying it would expand Milwaukee's public transportation options while boosting local economic growth. "Economic mobility is vital to our city's future," Moore said. "That's why I've dedicated so much time and effort in securing this multimillion federal grant for the Milwaukee Streetcar project. With this funding, we can expand our city's public transportation options while fostering local economic growth and development." The grant will be used to build the Lakefront Line and to purchase a streetcar that will operate on the line, Barrett said. Some of the money also will be used to add a second track on St. Paul Ave., between N. 2nd and 5th streets. The extension aims to give riders more flexibility and allow the Lakefront Line to run between the Milwaukee Intermodal Station and the lakefront during special events, such as Summerfest and the Fourth of July, the mayor said.